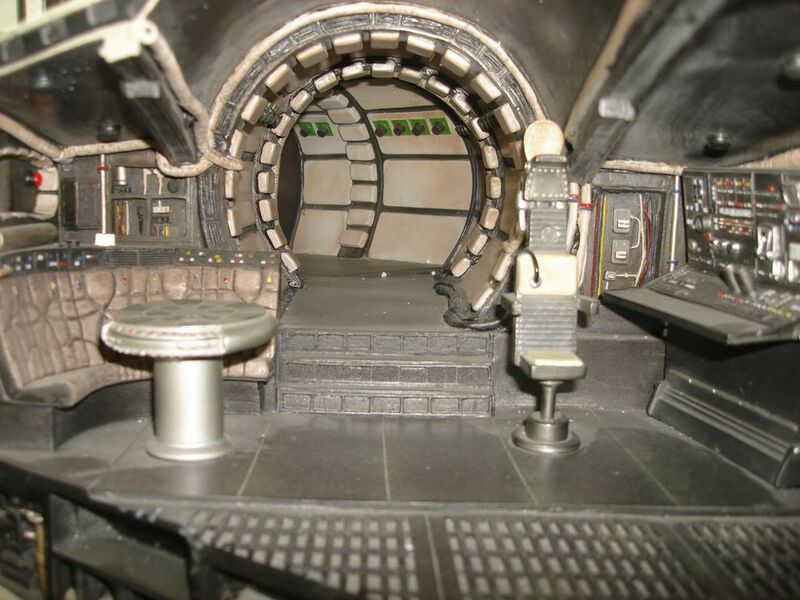 The Attakus Millennium Falcon and Death Star Hall Diorama. 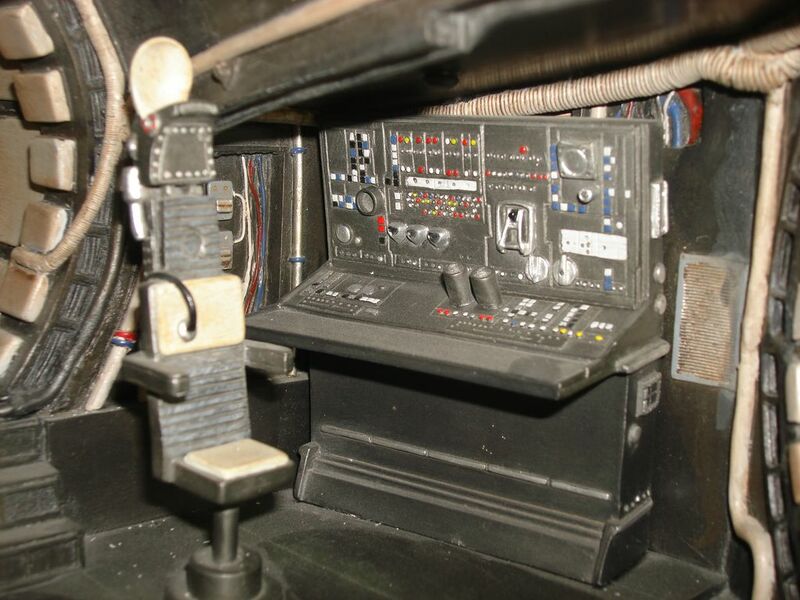 I’ve got some superb collectables relating to the Millennium Falcon, but I thought that i’d mention my favourite one. One that i regret that i didn’t get at the time and one that’s massively underrated as far as i’m concerned. This is a massive collecting grail for me. 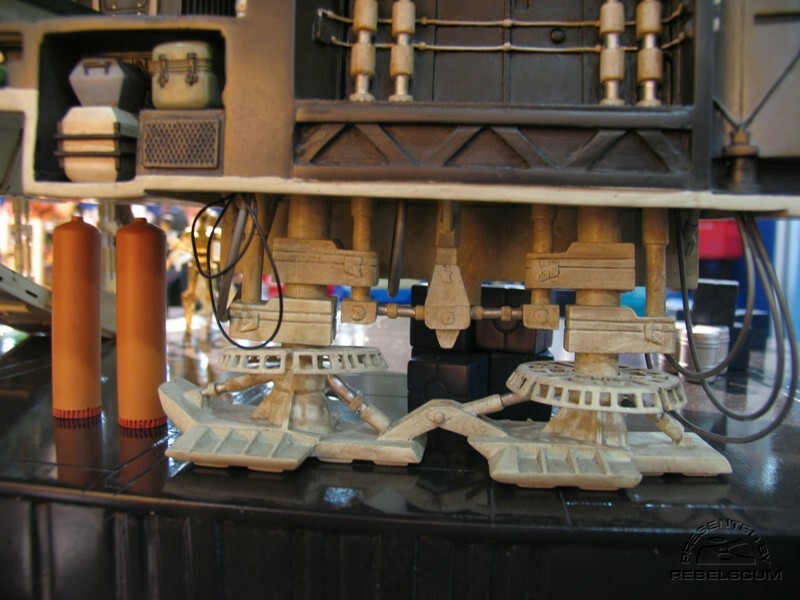 Back in 2005 Attakus announced that they were going to release a series of Six Metal Dioramas (one from each movie). A very brave line considering the size and the expense IMO. The first of these was the “Millennium Falcon and Death Star Hall” diorama from Star Wars (some might call it A New Hope, but it’ll always be Star Wars to me). 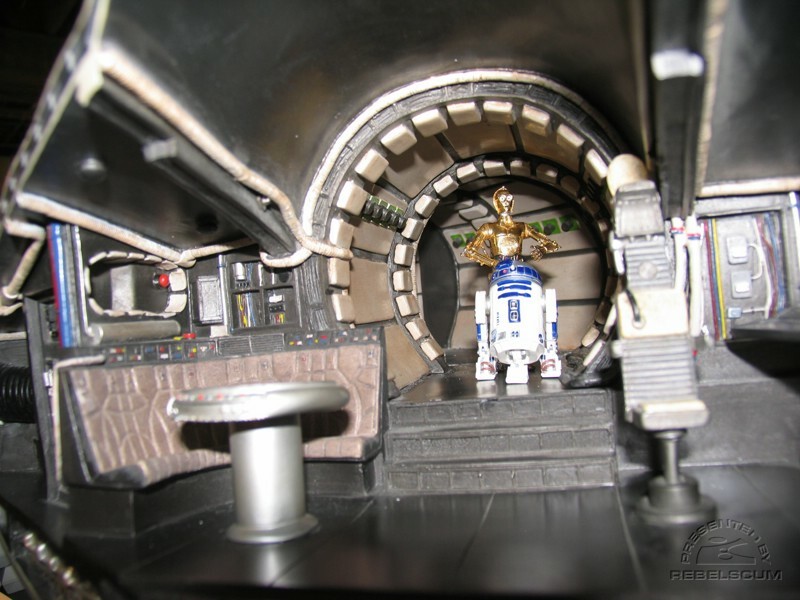 It’s more like two dioramas in one as the cutaway Falcon itself could be considered a Dio in it’s own right. It’s the only time that i’ve seen a high end version of the Falcon showing the inside and i Love it and I fully intended to get it. I’ve collected all the figures that were released and I still need to try and find two exclusive figures (Mouse Droid and Luke Skywalker in a Stormtrooper outfit. If anyone sees it, let me know ASAP please). Limited to 400 units worldwide. I was always a little disappointed that this wasn’t a very successful line, so i often wonder how many were actually sold. I never got round to getting the actual diorama itself. Unfortunately, not only did Attakus stop selling this before i was able to part with the cash, my wife has forbidden it due to it’s size, It’s 6 feet long. I did see one of these recently on ebay and i think that if it comes again i’ll get it, regardless of the grief that i get from the wife. (Please leave a comment with your hints on how i might possibly hide something that big.) It’s a shame that this line didn’t take off. I always felt that there should’ve been more figures released to go with it. There’s only so much that you can do with the figures provided. If you’re thinking of getting one, you really need a lot of room for it. 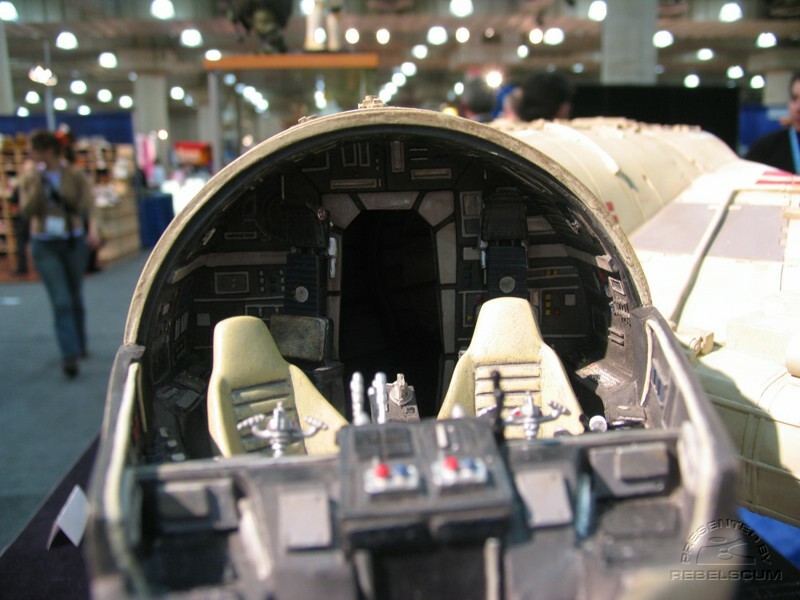 Not only because of it’s physical size, but because it’s so well done, you just have to display the both diorama and the insides of the Millennium Falcon to show it to the fullest effect. Anyway, here are a couple of photos. Just look at that level of detail. Will there ever be anything this adventurous in the future? I don’t think so, this is destined to be a classic collectible. I’d love to hear from anyone else who covets this. Perhaps someone who has one can let us know what it’s like? Is it difficult to keep dust free? How easy is it to findspace for it? 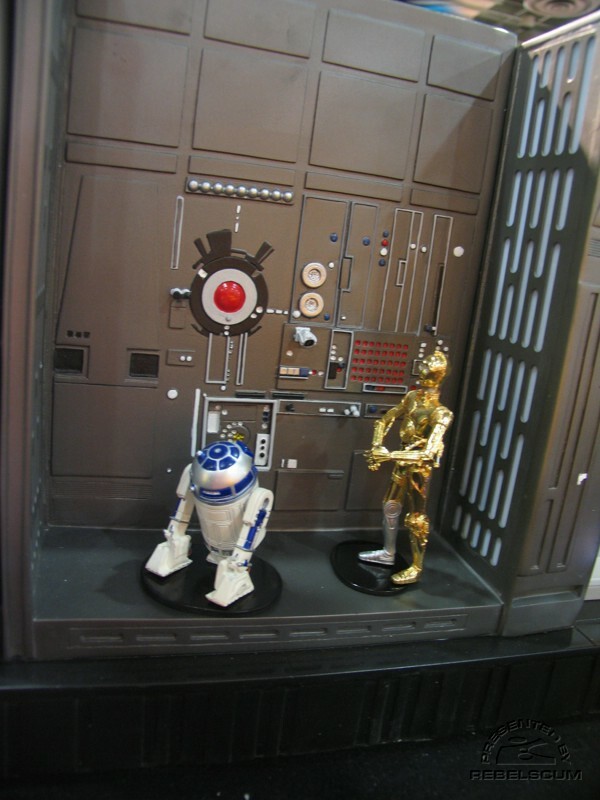 I still need to try and find some decent photos of the Exclusive Luke in Stormtroopers outfit and Mouse Droids. 12 March: I’ve recently taken to looking at the Attakus Metal figurines. To be honest, it’s probably the only time that i have actually sat down and looked at these since i initially received them. They’re still pretty good in my opinion. Vader, Obi-Wan, R2-D2, C3-P0, Stormtrooper Vanguard, Stormtrooper Sentry, Stormtrooper Commander , Stormtrooper Marksman, Luke in Stormtrooper armour and the Mouse Droids have been done so far. There’s a site called Entertainment Geekly who have one of these and have completed a pretty indepth reviews, Here, Here and Here. (You can see that i’ve just learned to link, can’t you? 🙂 )There’s plenty of photos and i think that they’re quite nice articles, although i am green with envy. 🙂 I tried to contact them to see if they got their Mouse droid and Luke Skywalker in his Stormtrooper outfit, but they haven’t got back to me. 10/02/12: I’ve just sent a mail to a shop in France that has one for sale. It’s a bit cheeky, but i’ve asked to pay in 20 monthly installments of €100 a month for 20 months. I’m not too hopeful but fingers crossed. 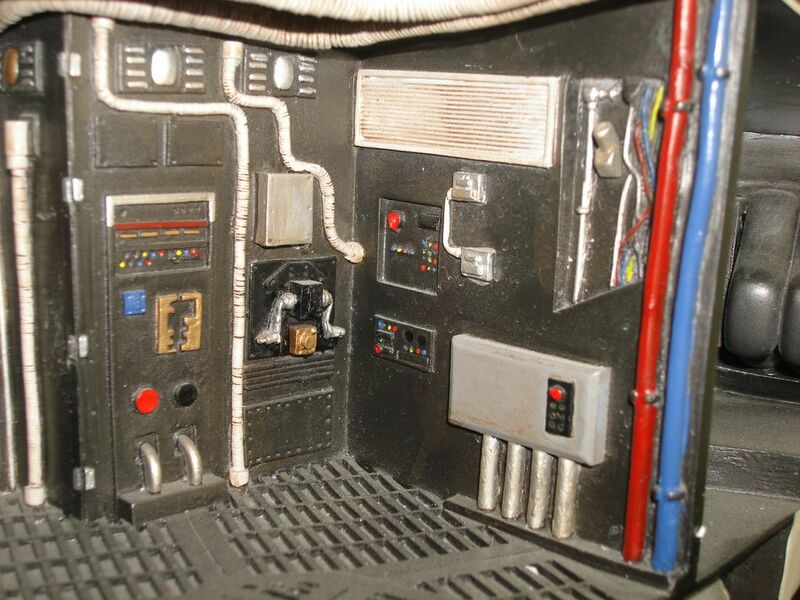 This entry was posted in Attakus, High End Collectables, Things that i don't have yet... and tagged Attakus, Attakus Metal, Death Star Hall, diorama, Millenium Falcon, Millennium Falcon, Star Wars. Bookmark the permalink. 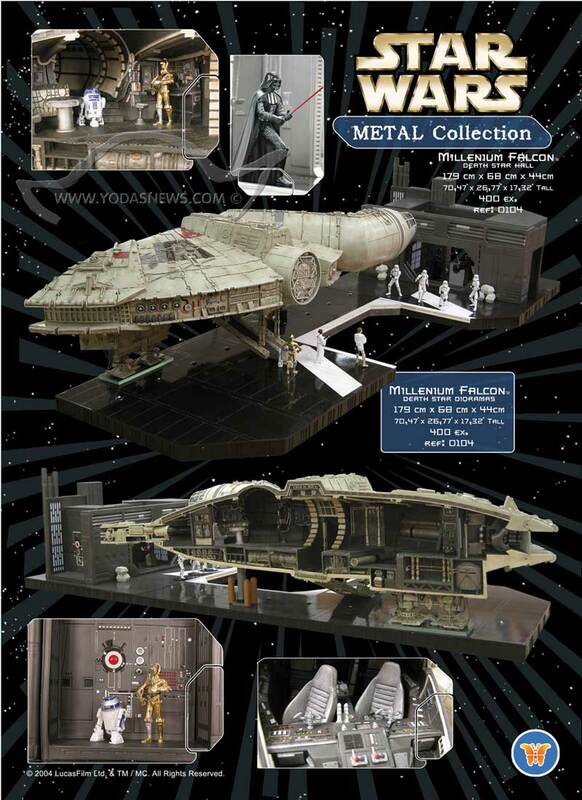 8 Responses to The Attakus Millennium Falcon and Death Star Hall Diorama. Hi I have the death star hall but I never got the exclusive figure. I emailed the company and they kept promising it to me. Even at SW CV I asked a Lucasfilm Licensing rep about it and they never got back with me. I think Steve Sansweet wrote in one the books that he never got his exclusive figure. So honestly, I don’t think they ever came through on their promise. 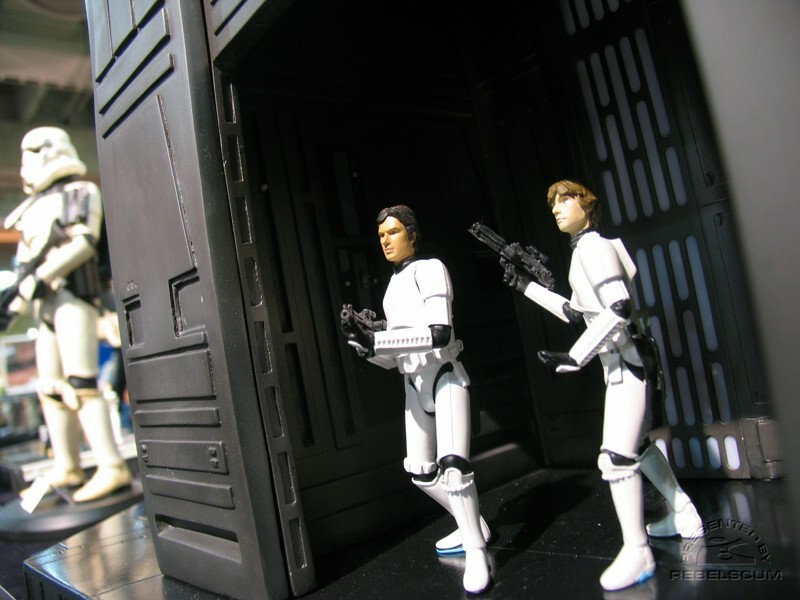 Also, I never found a Chewie so I use a hasbro figure. 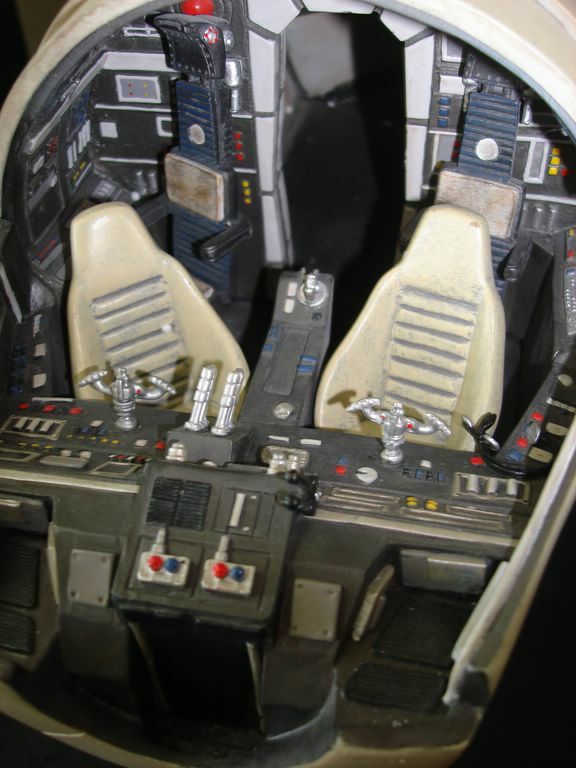 I also have the Big Falcon by Hasbro displayed with my Deathstar Hall. Yeah, this item was a financial bomb for Attackus. I wanted the Dagobah but it never came out. Another issue was the item was very heavy and kind of fragile. I broke a peace when off when I got it because I picked it up wrong. Still really cool though. Yeah! I’m I’m the process of getting one at €100 a month? I have heard that they don’t ship too well, but Ihave to risk it.